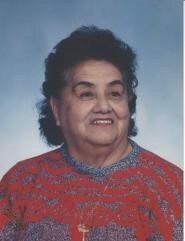 Elena Maria Bowman (Lopez), a longtime resident of Webberville, died on March 24, 2019 at the age of 89. She was preceded in death by her beloved husband, Clarence Wilbur Bowman in 2006, and son Michael Bowman, and is survived by eleven children: Maria (Hal) Winters, C. William (Sue) Bowman, Jennifer Lee, Barbara Szabo, Doug (Jannet) Bowman, Martin Bowman, Beatrice (Wes) Moody, Rebecca (Tim) Chase, Ron Bowman, Laura (Bob) Craigmile, and Rodger (Dayna) Bowman; one sister, Pauline Prieskorn; 33 grandchildren, 56 great grandchildren and 8 great great grandchildren; and many extended family and friends. Elena was born in Detroit, Michigan, as the youngest of six children of Severiano and Isabel Lopez. Elena met her husband Clarence while he was serving in World War II. They were married in 1946. Visitation will be on Wednesday March 27, 2019 from 2:00 p.m. to 4:00 p.m., and 6:00 p.m. to 8:00 p.m. (with Rosary at 7:00 p.m.) at Herrmann Funeral Home, 1005 E Grand River Ave., Fowlerville, MI 48836. Funeral Mass will be on Thursday March 28, 2019 from 10:00 a.m. to 11:00 a.m. (with visitation proceeding the Mass at 9:00 a.m.) at St. Agnes Catholic Church, 855 E Grand River Ave., Fowlerville, MI 48836. Internment will be at Holy Sepulchre Catholic Cemetery, 25800 W. 10 Mile Rd., Southfield, MI 48033 following the Funeral Mass.